We hear a lot about “application ecosystems” today. The old EDI (electronic data interchange) of the past has been replaced with an explosion of new services[i] that interoperate as value networks. Therefore, words like “ecosystem” make sense. But applications are not necessarily equal to services. A business service is a means of delivering value to customers (ITIL). Business services are often characterized by complex networks of value flows and forms of value, often involving many parties that influence each other in many ways[ii]. A business service is underpinned by IT services, which reflect the heterogeneous, dynamic and expanding nature of what are sometimes referred to as “application ecosystems.” The emergence of cloud computing, application programming interfaces (API), internet of things (IoT), microservices and other trends are accelerating these changes. Today’s digital business services are often supported by many different IT services. 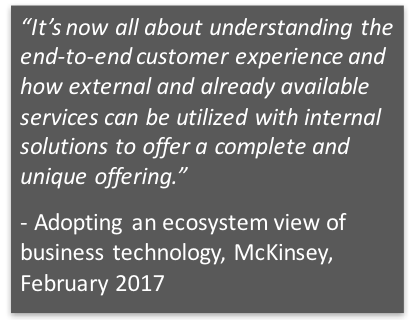 But whether you prefer the term “application ecosystem” or “IT service” doesn’t really matter – many service management concepts still apply. In fact, they’re more critical than ever. Supporting IT services can also span across systems of engagement, systems of record, plus systems of differentiation – further complicating the service management environment. What’s important is that the end-to-end business service, as experienced by the customer, is supported by many IT services. The traditional approach to monitoring has focused on relying upon specialized monitors for each technology domain: Oracle monitoring, web server monitoring, database monitoring, cloud monitoring, infrastructure monitoring, application monitoring and so on. As IT infrastructures evolve in scale and complexity, it is no longer sufficient to use a silo-based approach for monitoring, in which each technology tier is monitored independently by a different tool. IT teams need unified visibility and actionable insight to diagnose performance issues across the entire IT environment – both physical and virtual; both on-premises and cloud. The single pane of glass vision for unified monitoring is based on the ability to monitor where you are today. Your current production services are the only place where value is being delivered to customers, so unless you’re in a greenfield environment you will need to start back at the beginning, but leveraging your existing IT services. In addition, modernizing applications for migration to the cloud or to leverage emerging technologies such as containers and microservices will require a detailed understanding of how your current IT services work. Your ability to easily obtain an end-to-end baseline for each IT service (i.e., application ecosystem) will not only benefit operations, it’s critical as input to design and development. Your unified monitor of choice should also be able to demonstrate an ability to accommodate emerging technologies such as containers, microservices, APIs and others. How quickly your application ecosystem will need to leverage these innovations may influence your decision, but a demonstrated track record of keeping pace with complexity may be more important than support for a specific technology. Finally, the pace of change is accelerating so rapidly that focusing monitoring closer to where value is being delivered (i.e., Production and Pre-Production) may be the most effective and lowest risk approach, and minimize the possibility of repeating the silo-based mistakes of the past. There are three areas of IT services/application ecosystems that are critical for a successful unified monitoring strategy, so a truly unified monitoring solution will provide a single console that integrates all three areas. The focus on managing the end user experience starts with business services. User centered design (UCD), user experience (UX) as well as techniques such as journey mapping and moments of truth are all focused on understanding the digital business process, as experienced by the customer. From an IT service management perspective, managing the end user experience provides alignment to top-level business services. Real user monitoring and synthetic user monitoring can provide early warnings, and are critical guideposts that can ensure that the underpinning IT services are meeting business requirements. In some cases, aggregated measurements can provide metrics for the end-to-end customer experience that incorporate measures from multiple IT services, both internal and/or external (i.e., cloud) services. Today’s multi-tiered application architectures make application performance management difficult. Due to complex interdependencies between application tiers, the dynamic nature of application rollouts, and deployment on heterogeneous platforms (physical, virtual, and cloud infrastructures), IT teams often spend hours trying to determine the root cause of application slowdowns. If the issue is not in the application code, then the health of the application and the performance of all the underlying infrastructure tiers (server, network, storage, virtualization, cloud, etc.) must be analyzed to determine which tier could be the cause of the application performance issue. A unified monitoring solution should do more than converge end user experience, application and infrastructure into a single pane of glass. Unified monitoring is most effective when there’s a single source of actionable truth. It’s what moves us away from diagnosis-related activities, and toward collaborating on how to establish self-healing properties once an issue is identified. Beyond being just cost-effective, it’s a more “unifying” activity than troubleshooting. Organizations should not underestimate the importance of monitoring for IT service management how important it is to leverage services-oriented monitoring as a key enabler of IT transformation – unified monitoring can ensure that every application ecosystem that serves the business is included in the transformation effort. Today’s enterprise faces a critical need to accelerate IT transformation, and the explosion of IT services makes IT service management more relevant than ever. And, eG Innovations has been pioneering unified monitoring – a key driver for successful IT service management – for over a decade. The embedded analytics in eG Enterprise has proven its ability to keep pace with increasing complexity – from business service management to the industry’s first auto-diagnosis of virtual environments, cloud support, converged application/infrastructure support and code-level diagnostics. 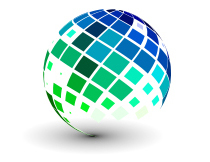 eG Innovations holds a stellar track record in adapting its monitoring capabilities to emerging requirements. eG Enterprise’s unified monitoring solution can be a critical enabler of IT service management, DevOps and other IT transformation programs. Contact eG Innovations to learn more. The post IT Service Management and Unified Monitoring: Getting From Here to There… appeared first on eG Innovations.